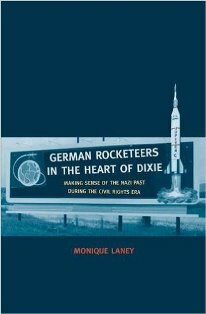 German Rocketeers was published by Yale University Press. Monique Laney, raised in Tuscaloosa and Germany, is now an assistant professor of history at Auburn and this book was her PhD dissertation at the University of Kansas, but do not be afraid. This book is accessible, clearly written with an easily forgivable amount of jargon, and should be of considerable interest to citizens of Alabama. To begin with what everybody knows: when NASA placed the development of the Saturn V rocket at The Redstone Arsenal, Huntsville, the research and development team of German rocket scientists, technicians of many kinds really, headed by Dr. Wernher von Braun, was moved from Fort Bliss, Texas. These German scientists had surrendered to or been captured by American forces near the end of WWII. Their work for the Third Reich had been to develop the V-2 rocket which Hitler ordered launched in large numbers from Peenemunde, an island in the Baltic. The V-2’s landed mostly in England and mainly in London, but were also aimed at targets in Belgium. The war was essentially already lost, and these rockets were a kind of last ditch effort, even an act of spite. The German scientists in Huntsville, affectionately known as “our Germans,” had been at work on ballistic missiles in Texas. Now they would be a part of the space race and indeed make huge contributions towards the U.S. landing on the moon in 1969. The German scientists scooped up by the Soviets were doing the same work. It was generally considered that except when we fell behind in the early innings and they launched Sputnik in 1957, our Germans were better than their Germans. Over time, Huntsville, and indeed all America, made heroes of our Germans. But there was, as they say, always an elephant in the room. Exactly what had they been up to back in ’44 and ’45? Were they ardent Nazis or purely scientists? Many claimed they had always been working on rockets for space exploration, but that was clearly applesauce. The V-2 rockets were assembled, the general population learned over time, by slave labor, some in fact POWs. Did the scientists know their factories treated workers cruelly and thousands died? Between 1950 and 1969 the population rose 8.5 times to 137, 802. Amid this growing prosperity, the scientific community also was a powerful force in the cultural life of the city, promoting the arts, especially music. In 1970, the new civic center was named the Von Braun Center. In Germany, on the other hand, the society was engaged in “vergangenheitsbewaltigung” which Laney defines as “the complicated process of relating to, negotiating, and struggling with the Nazi past and the Holocaust in which Germans have been engaged since 1945.” No one wanted this in Huntsville, partly because, Laney says, the Alabama parallel version would be coming to terms with the racist past. All this was fine until the Berlin Wall fell, East German archives were opened, and in 1984 Arthur Rudolph, project manager of Saturn V, was accused of war crimes by the Office of Special Investigation of the United States Department of Justice. Huntsvilleans were, for the most part, outraged and supportive but Rudolph chose not to fight in court. In an agreement with the DOJ he gave up his U.S. citizenship, but not his pension, and returned to Germany. Laney’s project, which she pursued exhaustively, is essentially oral history. She interviewed dozens of Huntsvilleans: first generation Germans, their children, native Alabamians, black and white. Oral history is, she explicitly reminds the reader, what people remember, what people think happened; it is not science. Nevertheless, what people believe happened matters. Almost all Germans, of both generations, professed ignorance and/or innocence. Nobody admitted to having been a Nazi. Several declared they did what they had to do to survive. If they had spoken out about what they knew or refused to obey orders, they would have been shot. Fair enough. Some argued the Rudolph investigation was a Jewish revenge plot, while many others said the war was a very long time ago and the scientists’ contributions to the U.S. space effort far outweighed any WWII transgressions. The Huntsville Jewish population disagreed. Laney’s project suggests a parallel between Germans and the Nazi past and Alabamians and the Jim Crow past. An honest examination of the past can help a society move forward, while denial of the past does little to generate truth and reconciliation.